Interstate 480 and the former Interstate 580 in central Omaha, Nebraska. Interstate 480 forms the inner belt freeway around central Omaha between I-80 at the Hanscom Park neighborhood and I-29 at Council Bluffs, Iowa. The route serves commuters to Downtown and various points of interest including Creighton University, TD Ameritrade Park Omaha (home of the College World Series) and the Midtown Crossing mixed use development along U.S. 6 (Dodge Street). Interstate 480 doubles as U.S. 75 from I-80 to Exit 2C and as U.S. 6 across the Missouri River to Broadway. The interstate switches cardinal directions at the interchange with the North Freeway (U.S. 75 / former Interstate 580), where it turns east from the Gifford Park neighborhood to Downtown Northeast. Interstate 480 between the Nebraska-Iowa State Line and Interstate 29 in Council Bluffs opened on November 12, 1966.1 This included the 1,687 foot long Glenville Dodge Memorial Bridge.2 The eight-lane steel plate girder bridge connected motorists with the U.S. 6 couplet of Dodge Street west and Douglas Street east. Interstate 480 was constructed north from a temporary end of I-80 east to the couplet of U.S. 6 (Dodge and Douglas Streets) in 1962. The Ak-Sar-Ben Bridge, which is Nebraska spelled backwards, carried U.S. 6, 75 and Alternate 30 across the Missouri River between Downtown Omaha and Council Bluffs until 1966. The two lane steel truss bridge was replaced by the Glenville Dodge Memorial Bridge and demolished by 1968. Interstate 480 was finished two years prior to the opening of the Missouri River Bridge along Interstate 80. The Plattsmouth toll bridge not replaced and instead was purchased by the city of Plattsmouth from the Plattsmouth Bridge Company in 2007 for $1. The 1929 opened, 402-foot long cantilevered truss bridge was refurbished in 2008.18 It is not designated as U.S. 34 Business and instead carries County Road L35 in Iowa and no designation in Nebraska. Exit 3A drops from the Interstate 480 viaduct onto 14th Street as the Gerald Ford Freeway swings southeast to combine with U.S. 6 across the Glenville Dodge Memorial Bridge. CenturyLink Center Omaha, an indoor sports and concert venue, rises just east of the elevated roadway as I-480 continues one mile to Interstate 29. Photo taken 06/18/15. U.S. 6 east merges onto Interstate 480 east from Douglas Street to cross the Missouri River into Council Bluffs, Iowa. U.S. 6 extends from the freeway end onto Broadway beyond Exit 0 and the ramps to I-29. Photo taken 06/18/15. Interstate 480 ends at the forthcoming directional T interchange with Interstate 29. Two lanes depart for Sioux City and St. Joseph while the mainline defaults onto Broadway. Photo taken 06/18/15. Motorists split between U.S. 6 (Broadway) east toward Downtown Council Bluffs and Interstate 29. I-29 south combines with I-80 east in two miles. The route travels another 183 miles to end in Kansas City. Photo taken 06/18/15. Interstate 29 leads north 92 miles to Sioux City. I-680 east ties into the route at Crescent in eight miles. Photo taken 06/18/15. A half diamond interchange connects the ending U.S. 6 freeway with 2nd Avenue at 36th Street and from Avenue A west. U.S. 6 lines Broadway, a commercial boulevard, to Downtown where it transitions onto Kanesville Boulevard back to I-80. Photo taken by Steve Hanudel (05/15/06). Although still in Nebraska, this set of signs was replaced by IowaDOT to use Clearview font. The panel for Dodge Park was also replaced to display Exit 0 to the Riverfront. Photo taken 09/05/05. Sign changes made by 2014 on the Glenville Dodge Memorial Bridge removed the exit numbers for Interstate 29. The Photo taken 09/05/05. These signs were also replaced by 2014 to use Clearview font. The reference to I-80 was not retained. Photo taken 09/05/05. The panels posted as the ramp partition for Interstate 29 north to Missouri City and south to Glenwood were carbon copied by 2014. This includes the tab referencing I-80. Photo taken 09/05/05. Interstate 29 encircles Council Bluffs from Exit 56 to the east split with Interstate 80. The freeway runs west along the Missouri River levee system from North 25th Street to G Avenue on the two mile approach to Interstate 480 & U.S. 6 west. Photo taken 06/18/15. The Downtown Omaha skyline comes into view as Exit 54A departs I-29 south for G Avenue. The directional T interchange (Exit 53B) with I-480 & U.S. 6 west lies to the immediate south. Photo taken 06/18/15. Southbound at the off-ramp (Exit 53B) for Interstate 480 & U.S. 6 west across the Glenville Dodge Memorial Bridge into Downtown Omaha. I-480 meets the North Freeway (U.S. 75) in 2.5 miles, which leads toward Eppley Airfield (OMA). Photo taken 06/18/15. Previous signs for Exit 53B on Interstate 29 south omitted the overlap of U.S. 6 west along Interstate 480 between Broadway in Council Bluffs and Dodge Street in Omaha. Photo taken 09/05/05. Replaced signs at the parclo interchange (Exit 54) with G Avenue. Photo taken 09/05/05. U.S. 6 finally appeared at the ramp departure of Exit 53B for I-480 west. There is no access to U.S. 6 (Broadway) east. Photo taken 09/05/05. The first sign for Interstate 480 west along I-29 north appears just north of the west split with I-80 adjacent to the riverboat casino complex off River Road. Photo taken 06/18/15. Leading north from 9th Avenue, Interstate 29 approaches the left-hand exit for Interstate 480 & U.S. 6 west to Nebraska. Photo taken 06/18/15. U.S. 6 combines with Interstate 480 west from Broadway to the couplet of Dodge and Douglas Streets through Downtown Omaha. I-480 west combines with U.S. 75 south at the North Freeway in 2.5 miles. Photo taken 06/18/15. These signs were replaced with Clearview font and no longer include the state name. Photo taken by Jeff Royston (03/16/05). Heading south by the Columbus Park neighborhood, Interstate 480 & U.S. 75 approach Exit 1A for Martha Street (former Nebraska 38) and reach Interstate 80 in one mile. Photo taken 06/18/15. Entering the diamond interchange with Martha Street on I-480 & U.S. 75 south at the Hanscom Park neighborhood. U.S. 75 transitions into the Kennedy Freeway in 0.75 miles. Nebraska 38 was decommissioned on January 1, 2003 when the route was turned over to the city of Omaha.20 Photo taken 06/18/15. Two lanes depart next for Interstate 80 west to Lincoln. Using the mileage from I-80, this is the only connection assigned an exit number from I-480 south. Photo taken 06/18/15. Exit 452C parts ways with U.S. 75 south as Interstate 480 ends. U.S. 75 travels high above I-80 to the Kennedy Freeway, which winds southeast to Spring Lake and Brown Park through south Omaha. Photo taken 06/18/15. A high flyover departs for Interstate 80 east through the Deer Park neighborhood to Council Bluffs, Iowa. U.S. 75 continues south ten miles to combine with U.S. 34 between Offutt Air Force Base and Plattsmouth. Photo taken 06/18/15. A non reflectorized interchange sequence sign remained in use along Interstate 480 & U.S. 75 south on the two mile approach to Interstate 80. The replacement made by 2008 did not retain the associated exit numbers. Photo taken 09/05/05. Approaching 42nd Street along side the Robin Hill neighborhood of Omaha, Interstate 80 is 1.5 miles out from the exchange with both Interstate 480 & U.S. 75 north and the Kennedy Freeway (U.S. 75) south. Photo taken 06/18/15. Exit 451 departs I-80 east for 42nd Street north to Hanscom Park and south to the Burlington Road neighborhood as a diagrammatic sign outlines the forthcoming partition of Exit 452 for I-480 north. Photo taken 06/18/15. 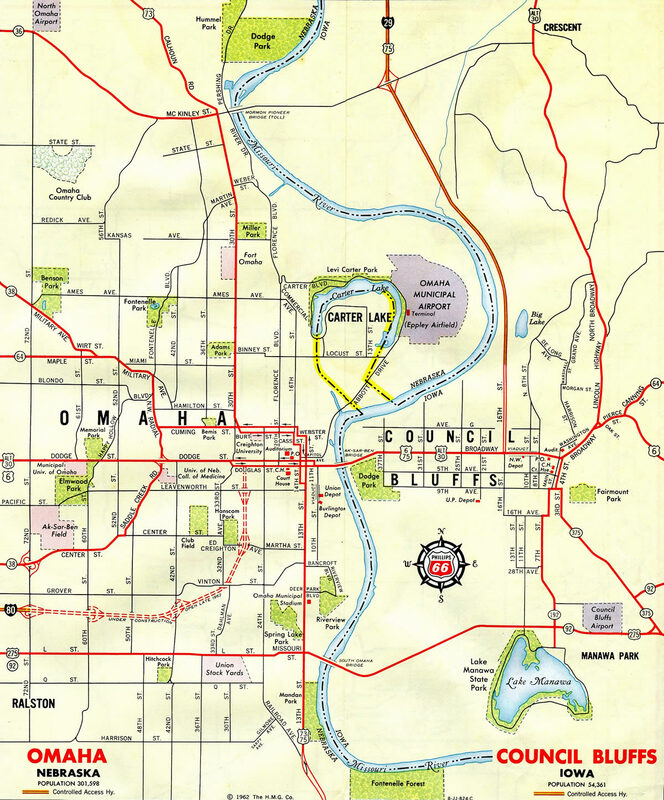 Interstate 480 and U.S. 75 combine northward from I-80 to the North Freeway, which joins Downtown with Eppley Airfield (OMA) and Florence. Photo taken 06/18/15. Interstate 80 expands to 12 overall lanes with auxiliary lanes between 42nd Street and the initial three wye interchange (Exit 452) with Interstate 480 & U.S. 75 north. Photo taken 06/18/15. All traffic bound for I-480 & U.S. 75 north to Downtown and U.S. 75 south to Bellevue departs in unison at Exit 452. A second three-wye interchange joins I-80 with the Kennedy Freeway otherwise to the immediate east. Photo taken 06/18/15. Guide signs for Exit 452 were both replaced by 2009 when a fourth exit lane was added for U.S. 75 (Kennedy Freeway) south. Photo taken 09/05/05. The ramp from Interstate 80 east to U.S. 75 (Kennedy Freeway) south was expanded to two lanes in 2008. Photo taken 09/05/05. Traveling west through the Deer Park neighborhood, Interstate 80 meets 13th Street prior to the back to back three wye interchanges (Exit 452) with U.S. 75 (Kennedy Freeway) south and I-480 & U.S. 75 north. Prior to 1989, a second local exit departed just ahead for 24th Street. Photo taken 06/18/15. Interstate 80 previously reduced to a single lane mainline through the exchange with U.S. 75 and Interstate 480 north. Construction completed in 1994 added high speed flyovers and removed left-hand ramps while expanding the mainline to four overall lanes. Photo taken 06/18/15. A half diamond interchange adds traffic to Interstate 80 west from 24th Street as Exit 452 lowers. Photo taken 06/18/15. Traffic splits for the Kennedy Freeway south to Bellevue and Offutt AFB and I-480 & U.S. 75 north to Downtown and Eppley Field (OMA). Originally named the South Freeway, the limited access highway carrying U.S. 75 through the Spring Lake and Highland South neighborhoods replaced 13th Street and Railroad Avenue as the alignment for U.S. 73 & 75. Photo taken 06/18/15. A diamond interchange joins U.S. 75 (Kennedy Freeway) with F Street and the Spring Lake neighborhood just south of the three-wye interchange with Interstate 80. Photo taken 06/18/15. Northbound U.S. 75 transitions from the Kennedy Freeway onto Interstate 480 as the eastbound off-ramp for I-80 departs. Prior to the 1989-94 rebuild of this interchange, a left-hand ramp connected U.S. 75 north with I-80 west while an adjacent folded diamond interchange with 24th Street resulted in a weaving traffic pattern. Photo taken 06/18/15. Two lanes separate for both I-480 & U.S. 75 north to Downtown and Eppley Field (OMA) and I-80 west to Lincoln. All roadways and ramps are elevated due to the Union Pacific Railroad passing below. Photo taken 06/18/15. 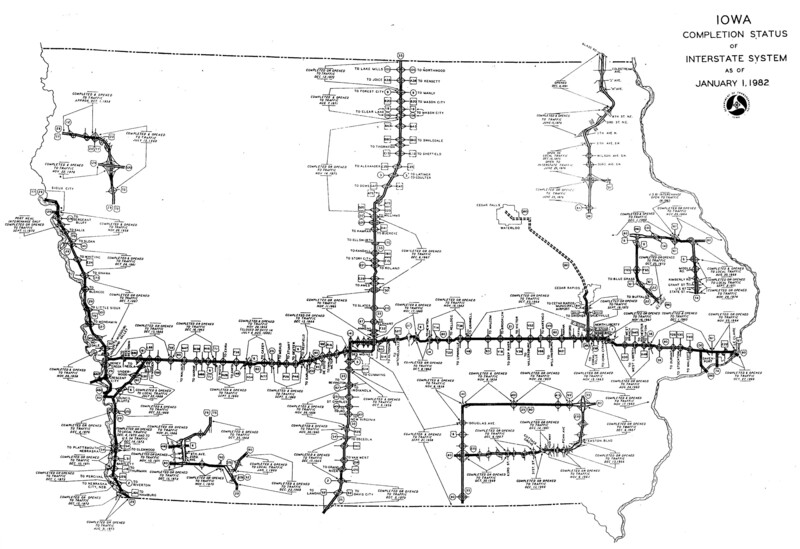 Iowa Completion Status of Interstate System as of January 1, 1982. Iowa Department of Transportation. Grenville Dodge Memorial Bridge, Johnweeks.com. “Coming in 2002: New 13th Street ramp to I-480.” Omaha World-Herald (NE), October 9, 2001. “Major Highway Interchange Nears Completion Interstate Engineer Hopes for No Repeat Of Wet ’93 Summer.” Omaha World-Herald (NE), January 2, 1994. 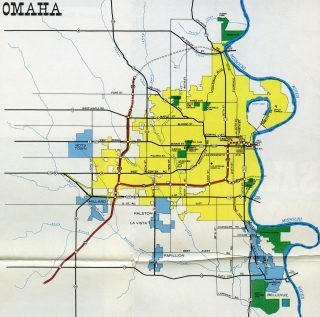 “Kennedy – Interstate 80 – 480 Interchange Work.” Omaha World-Herald (NE), June 29, 1994. “13th Street ramp to I-480 opening The street, north of Capitol Avenue to the ramp, should open by midday Friday.” Omaha World-Herald (NE), December 25, 2002. “OMAHA TIME CAPSULE.” Omaha World-Herald (NE), November 23, 2011. 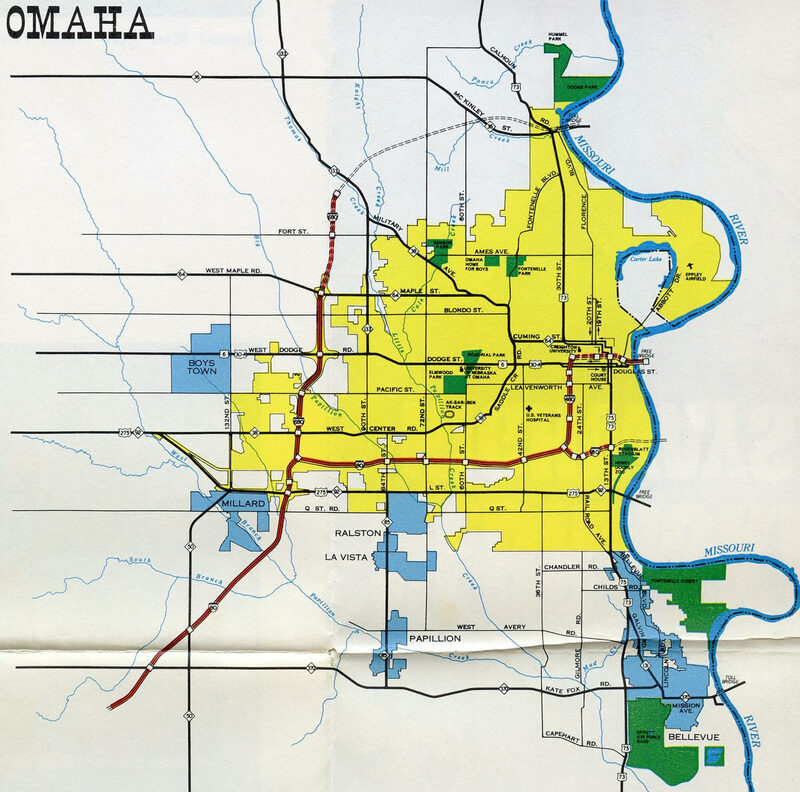 “Freeway rebuilding will mean slow going.” Omaha World-Herald (NE), October 13, 2003. “Work slated for downtown freeway – Rebuilding I-480/U.S. 75 (North Freeway) interchange.” Omaha World-Herald (NE), February 14, 2005. 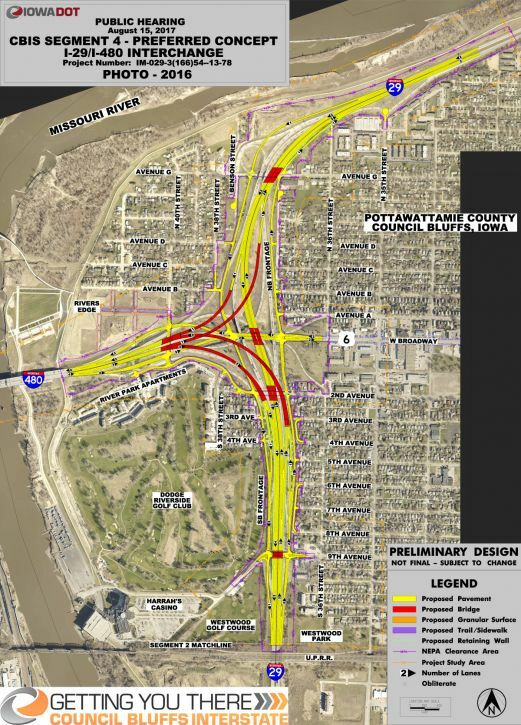 “Freeway junction work to begin – Ramp closures – Rebuilding I-480/U.S. 75 (North Freeway) interchange.” Omaha World-Herald (NE), July 16, 2005. 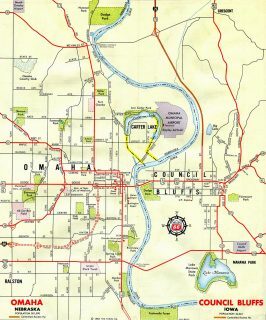 “Interstate plans hit 2-year snag – Work on the I-480 interchange is delayed until 2011; a lack of federal funds also affects Lincoln and Grand Island projects.” Omaha World-Herald (NE), December 5, 2008. “Celebrate demise of ‘bridge to nowhere’.” Omaha World-Herald (NE), December 5, 2008. US 75 / I-480 – Interchange Project http://www.nebraskatransportation.org/projects/480-75/index.htm, NDOR Project Web Site, Updated January 2011. “Bereuter Proposes 2 Missouri Bridges.” Omaha World-Herald (NE), September 20, 1999. “Plans for Bridges Keep Falling Dow.” Omaha World-Herald (NE), February 20, 2000. “Agreement Reached On Bridges Nebraska and Iowa can now go after funding for spans across the Missouri River in Cass and Sarpy Counties.” Omaha World-Herald (NE), May 17, 2000. “New bridge gives Nebraska drivers another link to I-29.” Omaha World-Herald (NE), October 21, 2014. “Changes to Council Bluffs Interstate interchange may be around the bend.” Omaha World-Herald (NE), March 15, 2016. Page updated January 26, 2019.